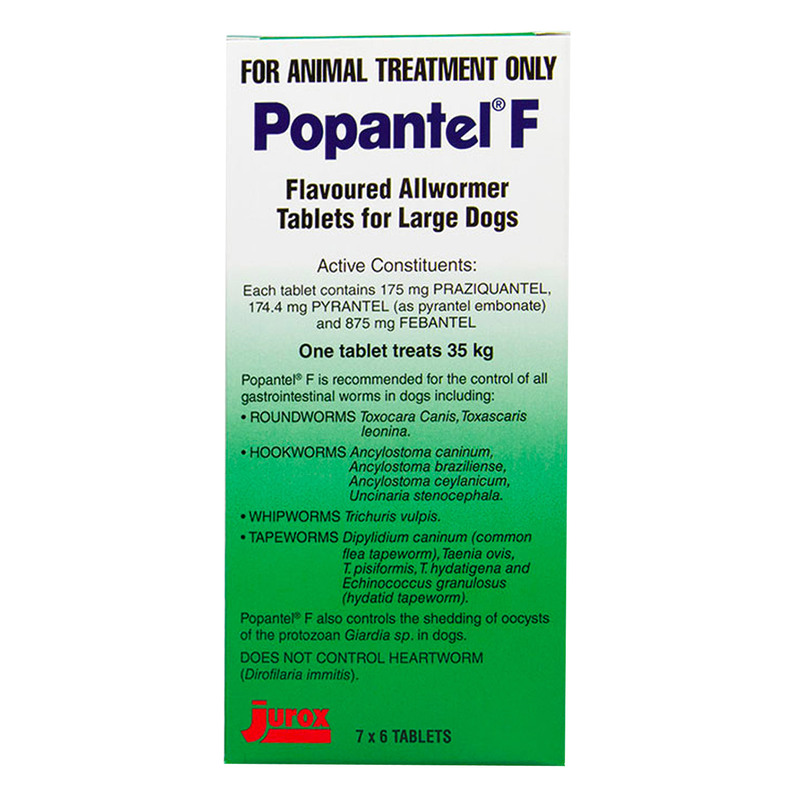 Popantel F Allwormer is a potent anthelmintic against multiple gastrointestinal worms in dogs. It is effective any intestinal helminths and giardia infections. It treats and controls roundworms, hookworms, whipworms and tapeworms. The oral formulation also acts against hydatid tapeworm. The worming tablet also controls the shedding of oocysts of the protozoan giardia. Popantel F allwormer is readily accepted by dogs and thus, easy to dose. Popantel F Allwormer is an ultimate worming treatment for dogs. The product is made up of three major ingredients – Praziquantel, Pyrantel (as pyrantel embonate) and Febantel. Praziquantel is highly effective in controlling various kinds of tapeworms. It is acts against Hydatid tapeworm also. The other ingredient Pyrantel – is a non-spectrum anthelmintic. It is effective against roundworms and some species of tapeworms. It controls the most important dog worms like roundworms including Toxocara canis and Toxascaris leonine and the hookworm. The third major ingredient Febantel is also a broad spectrum anthelmintic that is effective against the various types of whipworms and different hookworms. The three major ingredients have no residual effect. So, they act on worms and eliminate them without any side effects in dogs. Administer as a single dose by mouth. For treating hookworms and roundworms: Treat dogs and puppies at 2, 4, 8 and 12 weeks and then every month until six months of age and thereafter every 3 months. For treating whipworms: Treat every 6 to 8 weeks after 3 months of age. For hydatid tapeworms: Dogs in hydatid areas should be treated every 6 weeks. Giardia: Treat for three consecutive days. Repeat treatments as per vet’s advice. Dogs above 10 kg - 1 tablet for every 10 kg. Round off doses to the nearest ½ tablet. Popantel F does not treat heartworm disease. Weigh dogs before treatment for proper dosage. No possible contraindications found of using this product.